The aftermath of the Greek elections propelled the new radical left party SYRIZA into the limelight as the second strongest party in the country. Given the adamant refusal by SYRIZA leadership to accept bailout reforms, the party's new brokering position means the crisis will continue. Unlike Greece, Spain and Italy have debt problems that dwarf the ability of any Brussels-led support package. These economies are simply too large to be "rescued" from the outside. It is true that any members leaving the Eurozone will have a negative effect upon currency strength and economic prospects. It is also unclear how the Greek departure will aid in shoring up either Spain or Italy. The problems in each of these economies are endemic; they are not primarily a result of "spillovers" from the situation in Greece. All of which means, to borrow a phrase from former U.S. Secretary of Defense Donald Rumsfeld, there are a series of "known unknowns" now facing the EU. The credit and banking problems are essentially the "known" part of this equation. The extent of the fallout on the euro as a whole is the massive "unknown" flowing through the calculations. This is accentuated by recent developments in the two major economies using the euro -- Germany and France. No rescue package for any EU member is possible without the leadership of these two dominant European economies. To date, Paris has emphasized protecting its suspect banking sector, while Berlin has a strong political undercurrent demanding additional protection of German production and trade. However, the recent French elections, in which a socialist has been elected president, and indications surfacing that the German economy may be facing a slowdown, will put continued support of a "bailout for austerity" approach to Greece in question. Thus far, both major nations have led the EU-Greek approach, strongly arguing that the preservation of the euro demands it. The dramatic political events unfolding in Athens are rapidly undermining that support. And this has impacted the price of oil. However, the same contract for RBOB (Reformulated Blendstock for Oxygenate Blending) - the NYMEX gasoline futures standard - was up 1.6% for the week and 4.2% for the month. But while that assurance managed to siphon a few dollars off of oil futures, the reality is there's nothing Saudi Arabia - or anyone else, for that matter - can do about rising oil prices. For its part, Saudi Arabia is already breaking its own OPEC-imposed production quota limit, churning out about 10 million barrels of oil per day - close to its 12.5 million barrel capacity. Oil is still trading at $106 a barrel on the NYMEX - something that has clearly flummoxed the world's largest oil producer. And with tensions with Iran running high, we are currently in crisis mode. Pushed to the brink by Western sanctions, Iran has threatened to close the Strait of Hormuz - the narrow channel in the Persian Gulf through which 35% of the world's seaborne oil shipments and at least 18% of daily global crude shipments pass. The situation is further complicated by potential military conflict - such as an Israeli air strike on Iran's nuclear facilities. "Tehran is making a renewed political point here. The message is - we can close this anytime we want to," said Moors, who has studied Iran for more than a decade. "The oil markets are essentially ignoring the likelihood at the moment, but any increase in tensions will increase risk assessment and thereby pricing." 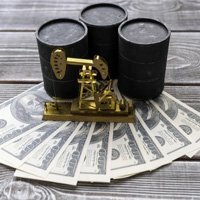 The energy crisis of 2008 - during which oil prices climbed to $147 per barrel before falling to the low $30s - led to some big rewards for investors locked in to the right companies. But with oil prices again approaching $100 a barrel, it's important to remember that not all oil plays are profit machines.